The 33967 Hamilton Beach slow cooker is considered one of the best slow cooker models on the market and a smart investment for any home, as it provides a wide range of automatic functions and accessories which turn any cooking experience into a pleasant one. Completely programmable for up to 12 hours and able to keep foods warm for no less than 2 hours, this slow cooker with a timer will surely be a great addition to any kitchen. By simply selecting the desired cooking time and temperature, you can literally walk away and do other tasks until the food is ready to be served. The great versatility of this programmable slow cooker is given by the 3 different cooking options (manual, timed and probe) and also by the smart design of the pot and accessories, making the device very handy and easy to transport from one room to another or even in the car. Whether you’re planning to prepare a tasty roast, to boil a vegetable soup or some eggs, to steam some meat or to make a tuna sauce for pasta, you’ll get the best results with this pot, due to its non-stick inside liner. The stoneware crock is removable, which means you can simply remove it from the stainless-steel housing and move it to the kitchen table to serve the meal. Featuring a 2-inch-wide touch-pad control panel, this slow cooker allows you to prepare your food in the way you desire, by selecting the temperature, the heat level (low, high or warm) and the cooking time. Although a little more complicated compared to traditional control dials, this panel is surely a great feature for a slow cooker as it eliminates the stress caused by uncooked or burned foods. The Hamilton Beach slow cooker has three different cooking modes, which enable you to prepare various meals by simply selecting the desired functions. The manual feature lets you cook the dish traditionally, while the other two options – the timed cooking feature and the temperature probe cooking are programmable, therefore completely automatic. The manual or traditional mode has two different temperature settings – high and low – but no timer so you can use this feature for heating previously cooked meals or preparing quick foods. The program or timed cooking option lets you select the desired time for preparing tasty meals and once the dish is ready, it shifts automatically to the keep-warm mode, preventing your from getting cold. Lastly, the probe mode available in this Hamilton Beach slow cooker is an unique feature which helps you cook perfect dishes by inserting the probe (meat, poultry, pork or other foods) into the tempered glass lid, through a small opening. Once the probe reaches inside this compartment, it sends temperature readings to the device, which automatically selects a specific temperature. Once the desired temperature is reached, the slow cooker will switch to the keep-warm option. The power interrupt protection featured by the device allows you to keep cooking the meal even during an extended power failure and this is another reason for which this device is considered by some the best slow cooker on the market. The 33967 Hamilton Beach slow cooker comes with an oval shaped pot with large, metal handles, riveted in place for easy carrying and safe lifting. Each handle has a plastic end grip, which maintains its coolness during the cooking process. The crock pot is made of ceramic, so it’s 100% heat resistant, just like the tough tempered-glass lid and the stainless steel housing. This feature is appreciated in lots of the available slow cooker reviews for this model, as it prevents the components from getting damaged regardless of the cooking temperature. The lid has two side clips that lock it in place while cooking or transporting the device from one place to another and also a full-perimeter rubber gasket. This guarantees all the ingredients are kept inside the crock pot and forms a safe cushion for the lid during simmering. Due to these two features, the lid preserves flavors and tastes perfectly and prevents foods from spilling. Another accessory delivered with this programmable slow cooker is the handy, clip-on spoon, suitable for stirring and for serving at the same time. Made of plastic, this spoon has a special design which enables it to sit neatly on top of the pot, so you will always have it ready to hand. All these components are dishwasher safe but they also clean up very easy manually, so you can have them always neat and ready to use whether you have a dishwasher or not. The slow cooker comes with a user manual which includes not only the needed instructions for handling and maintaining the cooker properly, but also some recipes for the moments when you lack ideas. 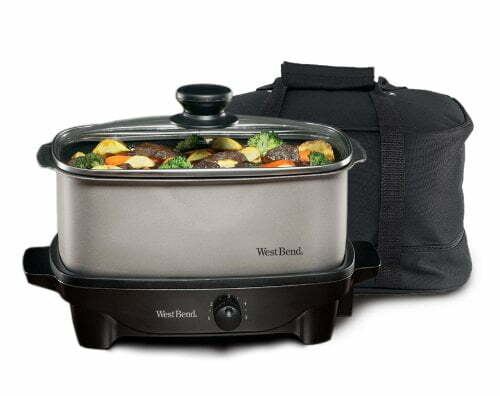 The device has a 16″ x 10.4″ x 16.1″ stainless-steel housing so it’s larger than other slow cookers but this isn’t necessary a disadvantage, as the model has a modern and attractive design with elegant black details, making it fit perfectly with absolutely any kitchen decor. The 6 quarts pot is large enough and smartly shaped to accommodate a whole roast or turkey up to 7.5 pounds, this being one of the reasons for which lots of buyers describe the 33967 model from Hamilton Beach as the best slow cooker for large families. Over 2000 reviews are currently available on Amazon for this product, no less than 1600 users assigning this device a 5-star rating. The friendly features, the elegant and modern appearance, as well as the different cooking options of this slow cooker recommend it as a must-have for any kitchen. 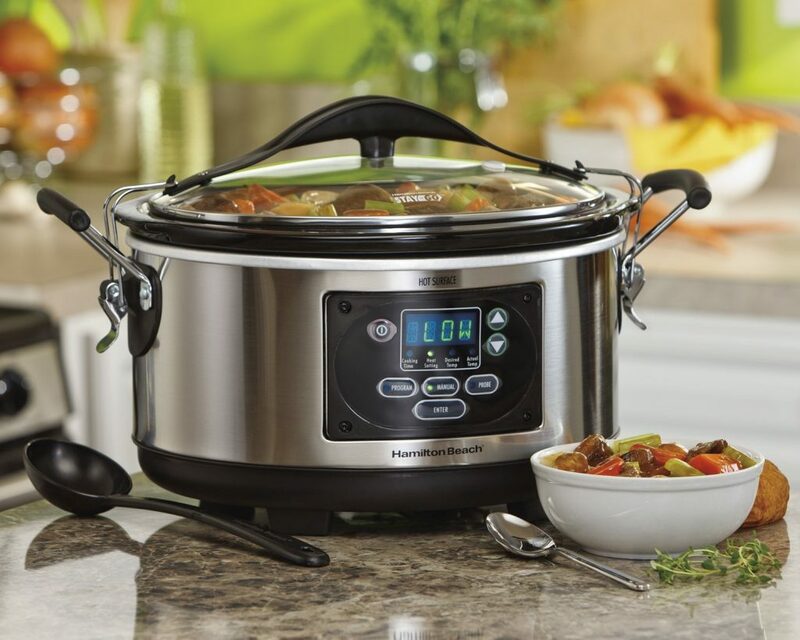 One of the best features of this Hamilton Beach slow cooker is the probe setting, which adapts the temperature automatically and increases it until the desired level is reached. Once the dish is thoroughly cooked and ready to be served, the keep warm function is activated. 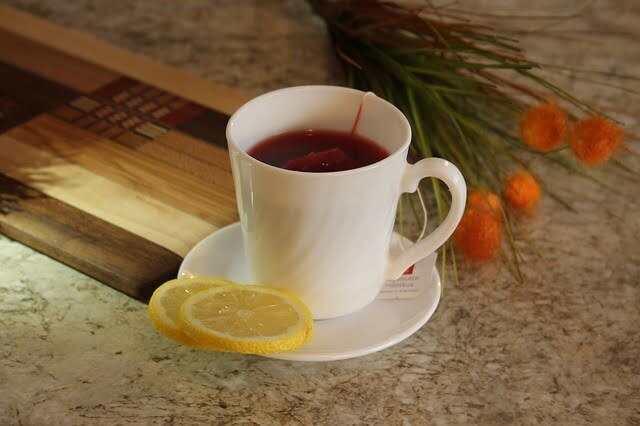 This is extremely convenient for people who enjoy a warm, homemade meal after a busy working day, as well as for those who don’t like spending too much time in the kitchen when preparing meat or poultry. By activating the probe setting, you will no longer have to check the slow cooker several times to see whether the meal is ready or not – the slow cooker with timer never burns the prepared dishes. 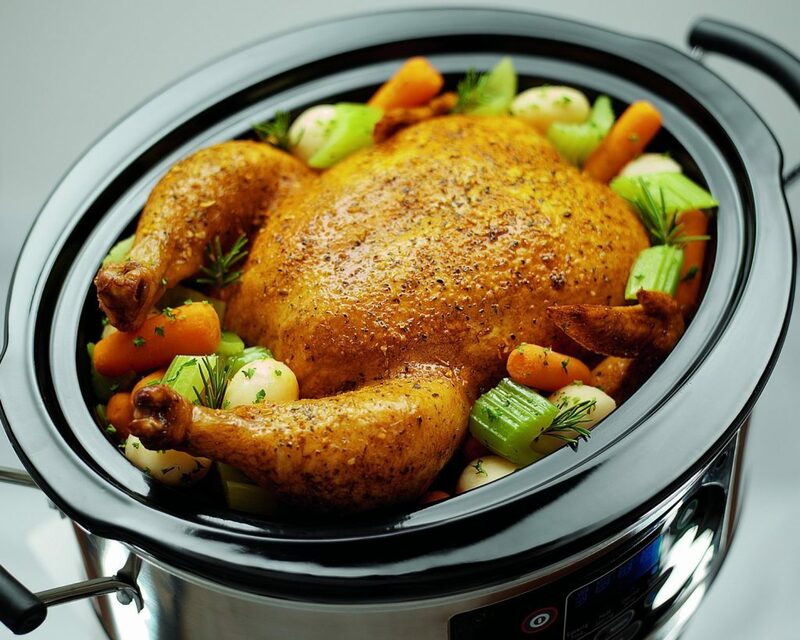 Another reason why this slow cooker is highly recommended as the best slow cooker for daily use is the particular combination of materials from which it is made – stainless steel, ceramic, and glass. Thanks to its structure, the tool eliminates the problem of heating up the kitchen, typical for oven cooking, so you can use it even during hot summer days without having to worry about the discomfort generated by the increased indoor temperature. Also, the one year limited warranty is surely a plus for this product, as it guarantees the manufacturer will replace any damaged components. One minor drawback, mentioned in some of the less positive slow cooker reviews, is represented by the fact that the lid locks are a little difficult to take off and on. Some customers complained they have to spend a few minutes ‘playing’ with these tools in order to fix them in place or remove them from the pot. Still, this isn’t necessary a minus, as it shows the lid is tightly locked on the cooker and remains in place while preparing various dishes. Moreover, this feature allows you to take the programmable slow cooker with you while traveling without having to worry about the meal being spilled on your car’s upholstery.